The Official DJ of the Saskatchewan Rush, Dj Anchor of Armed With Harmony does more than DJ â€ª#‎SaskRushâ€¬ Lacrosse games... he seen DJ'ing for CTV Morning Live - Saskatoon, Summer Festivals, Fri/Sat nights atSutherland Bar, Weddings, Corporate Events, and was even out at theSaskatoon Farmers' Market this past Sunday! Between working and travelling this summer we wanted to catch up with Trystan and ask how his experience during his FIRST SEASON with the Rush was! "Last season was a year of first's! First PRO sports Team in Saskatchewan, first SOLD OUT SaskTel Centre and first NLL Championship in Saskatoon! 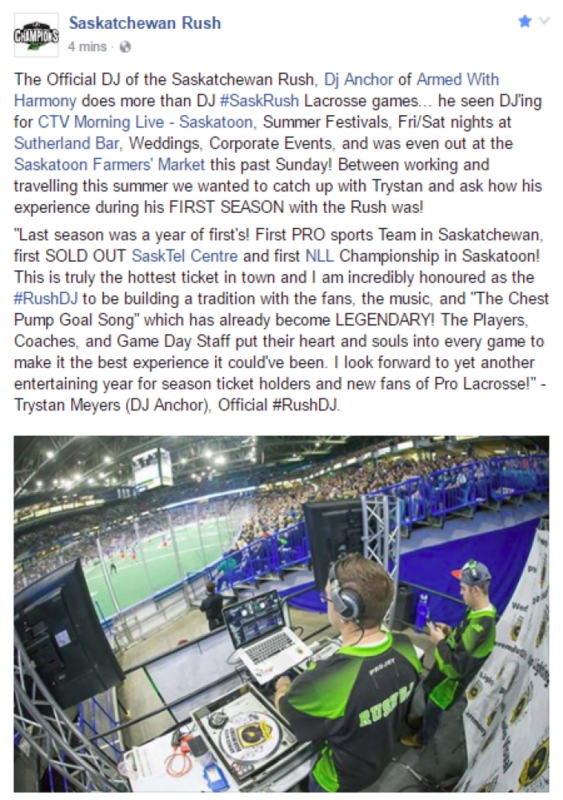 This is truly the hottest ticket in town and I am incredibly honoured as theâ€ª#‎RushDJâ€¬ to be building a tradition with the fans, the music, and "The Chest Pump Goal Song" which has already become LEGENDARY! The Players, Coaches, and Game Day Staff put their heart and souls into every game to make it the best experience it could've been. I look forward to yet another entertaining year for season ticket holders and new fans of Pro Lacrosse!" -Trystan Meyers (DJ Anchor), Official #RushDJ.